Marble bonded to porcelain in 1.2cm thickness. Polished marble surface, 3mm thick, unglazed porcelain base, 9mm thick. 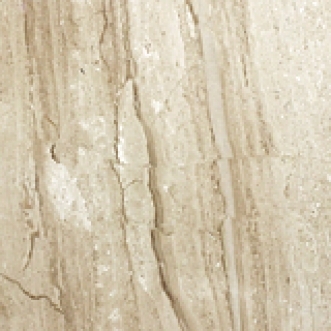 Daino Royale has variegated cream and light brown tones with medium to fine quartz veining; some fossil deposits. Commercial and residential interior floors and walls. Lighter and Thinner than Regular Marble; 3mm of marble adhered to 9mm of porcelain for a total of 12mm, compared to 20mm for the same size. More Durable; The porcelain/marble combination actually improves the physical properties of natural stone; there is less risk of breakage during transport and installation. Easy Installation; Since it is porcelain backed, porcelain installation methods can be used. Suitable for indoor floors and walls.